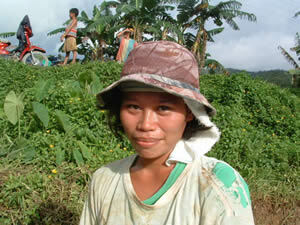 The Bisayan word for cooked rice, kanon, is nearly identical to the word for eating, kaon. 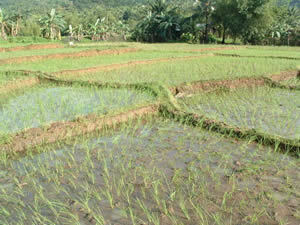 Riding around Dinagat Island on motorbikes, we passed many basaks (rice fields.) 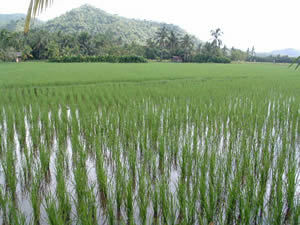 The island is very mountainous, but unlike islands such as Cebu, there is no coastal plain; so the only easily suitable places to grow rice are at the bottom of the narrow river valleys. 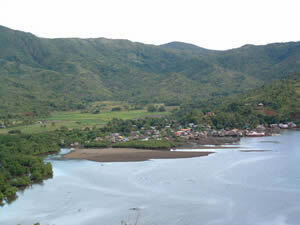 Here's a picture of a typical Dinagat coastal barangay, the green basaks nestled at the base of the mountains and the village houses and fishing boats in the foreground. 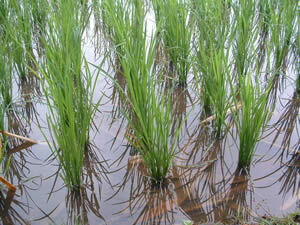 As some of my friends know, I've long fantasized about growing rice; it's been one of my dreams. 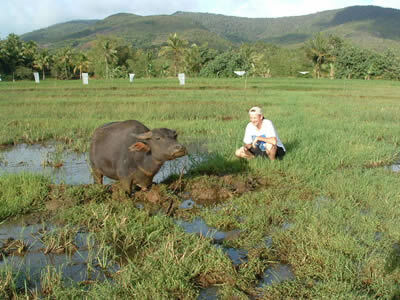 My own basak and carabao (water buffalo), and free rain from the heavens; who could ask for more? 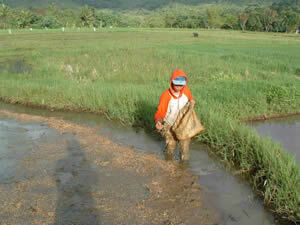 December and January are the wetttest months in Surigao, prime weather for planting rice. Riding around one day we saw people planting rice. I asked to stop and had Ana go over and talk to the farmers. They were agreeable, so next day we showed up again ready to get our feet muddy. 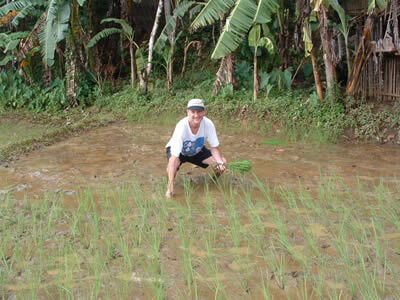 When I walked out into the submerged paddy, a laughing woman named Feley gave me a big handful of rice seedlings and showed me how to plant them (it's not really rocket science): grab three or four seedlings in a bunch and stick them directly down into the mud. My planting speed was only a fraction of Feley's, but I was careful with the seedlings and hope that the several hundred I planted will grow up to be big, strong rice plants. Ana enjoyed planting for awhile but developed a skin reaction (probably to the mud) and had to stop. 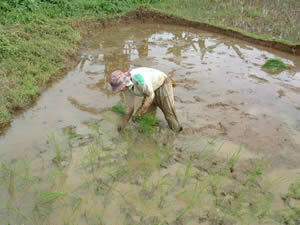 Alex got the hang of it in a hurry and soon was sticking seedlings in the mud like a life-long rice farmer. There's something about the color of young rice plants that sends me into deep relaxation. 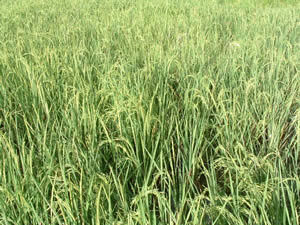 Heck, ya gotta admit that even middle-age rice plants, nearly ready for harvesting, are pretty attractive. 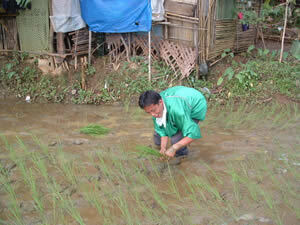 Sprinkling sprouted rice into a nursery patch to grow seedlings. 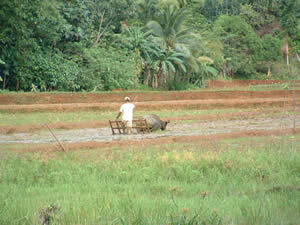 A carabao, a man and a wooden plow: just like a thousand years ago. My future best friend, the carabao. 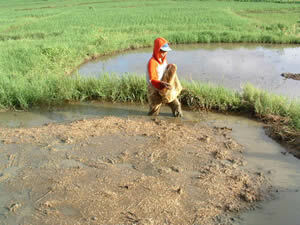 Farmers along the Yangtze River in China began cultivating rice sometime around 5000 B.C. 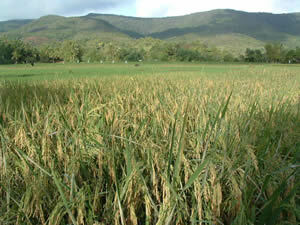 In 2003 the Philippines is predicted to grow about 13.1 metric tons of rice. The country will import an additional 1.1 metric tons, mostly from Vietnam, to meet domestic demand. This latter number is expected to increase in the future, given rapid population growth coupled with static domestic production. 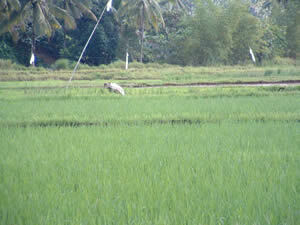 2004 has been designated as International Year of Rice by the Food and Agriculture Organization of the United Nations. This is intended to reflect the importance of rice to global concerns regarding food security, poverty alleviation, preservation of cultural heritage, and sustainable development. Maybe rice is God. Amen and pass the kanon.